Authors: Gil-oulbé M., Qbaily J. Aims. Thin shells in the form of cylindroids are fourth-degree ruled shells for which few works are devoted. In this paper, their geometric modeling is worked out and their middle surface are plotted, using the software MathCAD. Their stress-strain state are instigated with two building material: reinforcement concert and qualitative steel. Methods. This linear investigation is done for fixed and hinged supports and for various thicknesses in the software SCAD. The numerical values of their maximum and minimum displacements of their middle surfaces are given. Based on these displacements, conclusions are made for the whole paper. Results. The linear analysis for reinforced concrete and metallic shells, computed using the software SCAD gives the numerical and graphical results that are presented. Conclusions. The investigations of the stress-strain state are done for shells with the shape of cylindroid with two directrices ellipses and cylindroid Frazer. For the same thickness, loading and span, the reinforced concrete shells has minimum displacements. For thickness, 20 cm the steel shells have the same maximum displacements. For the thickness 30 cm the maximum displacement is more in steel shells. It is more optimal to use reinforced concrete shells than the one in steel. A large span (till 30 m) shells can be designed with reinforced concrete. cylindroid surfaces, linear investigation, geometric modeling, stress-strain state, displacements, middle surfaces. Introduction Cylindroid surface is a fourth-degree ruled surface, generated by a straight line D, which continuously changes direction, lying on two curves that are different in space, G1 and G2 and which is always parallel to a plane P (figure 1) . Cylindroids - ruled surface, formed by the moveof cylindroids, for example, a cylindroid with two directory circles in mutually perpendicular planes. A cylinder, which one of the two directrices is straight, is a conoid. Thus, a conoid is a special case of a cylindroid. For example, if two parabolas are taken as the guide curves of a cylindroid. For example, if the directrix curves are two parabolas, then the implicit definition is: 2 2 ment of a rectilinear generatrix along two curvilinear directrices, and in all positions the generating straight с(y -Ь ) x = 0, z = Ь2 2 2 line is parallel to each plane of parallelism. Cylindroids are negative Gaussian curvature surfaces. That's why they cannot be turned into a plane without tears and folds. They belong to the family of Catalan surfaces. A cylindroid, excluding screw cylindroid (direct helicoid) cannot have a constant mean curvature. A cylindrical surface can be obtained as particular cases f(y -Ь ) и x = l , z = , (1) Ь2 where с and f are the distances from vertices to parabolas, lying in planes x = 0 and x = l respectively, to z = 0 (rising height), and for the plane of parallelism the plane у = 0, then we get a parabolic conoid (see “Parabolic conoid”). G2 G1 Figure 1. The creation of cylindroid surfaces Helical cylindrical surface, generated by a straight line, which moves in space, parallel to the parallelism plane, all the time intersecting the helix and the surface of a straight is a circular cylinder. The axis of the helix of the cylinder coincides forming a straight line and the axis is crossed at right angles, therefore, the plane of rising height. If two directrices curves are given: r1 = r1(u) = x1(u)i + y1(u)j + z1(u)k и r2 = r2(v) = x2(v)i + y2(v)j + z2(v)k. (2) plane of parallelism ХОУ, then the condition must be met z1(u) - z2(v) = 0, where the dependency is v = f(u). If the plane YОZ (x = 0) taken as a plane of parallelism, it is necessary to fulfill the condition x1(u) - x2(v) = 0, and then find v = f(u) . Constructed according to triangulation method, 1. flat figure, bounded by a closed broken line and divided into triangles, so that the segments of broken lines were sides of triangles, the ends of these segments would be vertices of no more than four triangles. λ=0 λ=1 (u)r1-(v)r2 R (v)r2 Classification of cylindroids according to the shape 1. Cylindroid with two directrices ellipses (figure 3) The parametric equations are x = x(u) = а а ∗ u , y = y(u, v) = [b u(b d)] ∗ cos(v), z = z(v) = С ∗ sin(v), (4) where 0 ::: ::: , 0 ::: v ::: 2π. (u)r1 Figure 2. Kinematic of cylindroids This vector equation of a cylindroid, generated on these two directrices curves (figure 2), can be written as R = R(λ, u) = = r1(u) λ(r1(u) r2(v = f(u)), (3) where 0 ::: ::: 1. After the plane of parallelism is chosen  (directrices plane) dependence v = f(u). For example, if the coordinate plane is taken as the Figure 3. Model cylindroid with two directrices ellipses 2. Cylindroid with two directrices circles in mutually perpendicular planes (figure 4) The two circles are with the same radius and directrices curves for a cylindroid. The parametric definition is: 3. Cylindroid Fraser This cylindroid is shown in figure 6 and parametrically is defined as follows: v x = x(u, v) = а(1 + сosu)(1 - v), x = x(u, v) = ( ) (1 + u) , 2 v y = y(u, v) = а ∗ v(1 + cosu), z = z(v) = а ∗ sin(u), (5) where 0 ≤ u ≤ 1 , 0 ≤ v ≤ 2π, and а is the radius of the circles. Figure 4. Model cylindroid with two directrices circles in mutually perpendicular planes Thus, this case of cylindroid with circles in mutually perpendicular planes will be an elliptic cylindroid, y = y(u, v) = ( ) (1 - u), 2 q z = z(u, v) = jr2 - (v - p)2 + ∗ (1 - u), 2 -1 ≤ u ≤ 1 , p - r ≤ v ≤ p + r, (7) where r is the semicircle radius. Figure 6. A model of cylindroid Fraser If q = 0, then the parametric equations will be: v x = x(u, v) = ( ) (1 + u) , 2 v that is, the surface has zero Gaussian curvature (figure 5). Their parametric forms of definition are: y = y(u, v) = ( 2 ) (1 - u), x = x(u, v) = а(1 + сosu)(1 - v) , y = y(u, v) = а ∗ v(1 - cosu), z = z(v) = а ∗ sin(v), (6) where 0 ≤ u ≤ 1 , 0 ≤ v ≤ 2π. z = z(u, v) = jr2 - (v - p)2 . (8) 4. Cylindroid with a parabola and sinusoid at parallel ends Consider a cylindroid whose parabola and sine wave are directrices (figure 7). Their parametric form of definition is: x = x(u, v) = v ∙ l , y = y(u, v) = u, z = z(u, v) = (1 - v) ∗ (Ь - а ∙ u2 ) + + d + с ∙ cos п ∙ u ∙ π 2 ∙ Ь а ∙ v, Figure 5. An elliptic cylindroid 0 ≤ u ≤ 1 , - Ь ≤ v ≤ Ь . (9) а а Figure 7. Model cylindroid with a parabola and sinusoid at parallel ends 5. Bolla’s cylindroid The parametric form of definition is: x = x(r, θ) = r ∙ cos(θ) , y = y(r, θ) = r ∙ sin(θ), z = z(u, v) = k ∙ cos(θ) ∙ sin(θ), (10) where k - constant depending on the parameters of the two screws (р1-р2) from the shortest distance between these screws and from the corners between the axes of the screws. Figure 8. Model of Bolla cylindroid Overview of literature Many works are devoted to the geometrical investigations of cylindroid shape of thin elastic shells. In paper , Z.Z. Wang and L.Y. Jiang, investigated thin cylindroid shells subject to internal linearly-increased pressure. Close cylindroid shells are used for it. Membrane theory of shells is used to take an analytical solution to investigate the internal force distributions and deformation laws of such shells. The result shows that, under the condition of two-point simple supports, among three force components (meridional force T1, circumferential force T2, and shear force T12), T1 is the dominant one, which is negative (compressional) in the vicinity of the neutral axis, and becomes positive (tensional) after being away from the neutral axis. The shear force T12 is rather like a sine curve, which changes its sign at the neutral axis. Guo Ying Yin Zhixiang in article  made the nonlinear analysis for the prestressed lattice shell structure of twolayer cylindroid. A new form of cables for the prestressed lattice shell structure is put forward. It means all the down string poles are replaced by the high strength steel cables along the short span and different prestresses are applied to every cable. By calculating the model example of two layer cylindroid prestressed lattice shell structure, based on the nonlinear analysis by ANSYS, the character of the stress and displacement of the structure are got, which will give necessary parameters to actual engineering design. Korotkiy V.A., Usmanova E.A., Khmarova L.I. investigated the geometric modeling of cylindroids. The geometric model of a surface is formed taking into consideration the set of functional, structural, technological, economic, and aesthetic requirements. These requirements are formulated in terms of geometry and are expressed through the surface parameters. The surface is modeled with the help of either the kinematic method or the two-dimensional interpolation method. In accordance with the kinematic method, the surface is formed as a continuous oneparameter set of curves, which forms the simulated surface. The kinematic method studied in the article is based on the curves of the second order with variable eccentricity. In order to control the shape of the constructed surface, directing ruled surfaces are used. The authors develop a computer program which determines the eccentricity of the forming curves depending on the boundary conditions. In paper  Liliana Tocariu shown that cylindroid surfaces are part of the ruled surfaces category which are largely used in industrial product design, in construction work, in architecture. They appear in practice under the form of sheets (thin surfaces) that limit the different zones of some solids. For instance: the roofs of halls with large base structures, parts of the bodies of different cars, pieces of furniture, forms of original packages, forms of food products, different objects, etc. Alba Perez and J.M. Mccarthy show that Bennett’s linkage  is a spatial 4R closed chain that can move with one degree of freedom. The set of relative displacement screws that form the one-dimensional workspace of this device defines a ruled surface known as a cylindroid. The cylindroid is generally obtained as a result of a real linear combination of two screws. Thus, the workspace of Bennett’s linkage is directly related to a one-dimensional linear subspace of screws. In this paper, we examine in detail Bennett’s linkage and its associated cylindroid, and introduce a reference pyramid which provides a convenient way to relate the two. These results are fundamental to efficient techniques for solving the synthesis equations for spatial RR chains. 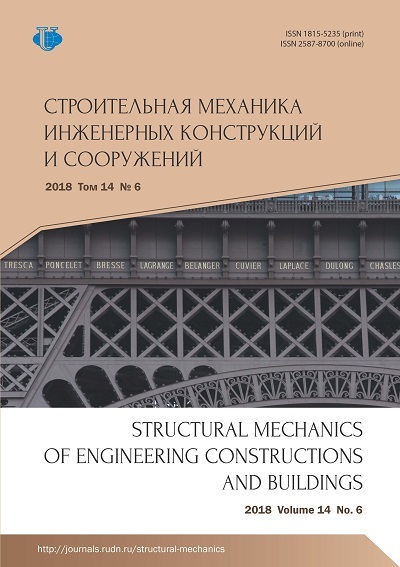 Additional information on geometry, static and dynamic strength analyses, and application of cylindroid shells is given in the encyclopedia  and in the manuscript . Linear analysis of some cylindroid shape thin shells Let us consider two types of cylindroid shape - metallic and concrete thin shell. The shells are subject to the following loads: 85. self weight; 86. live loads (2 kN/m2); 87. dead loads (10 kN). The shells are investigated each with two types of support: 88. fixed support; 89. hinge support. The load combinations in the used software SCAD is: (1.2 ∙ self-weight + 1.3 ∙ live loads + 1.1 ∙ dead loads). a - FE model of cylindroid with two directrices ellipses. The maximum span is 20 m. Figure 9. FE model of cylindroid with two directrices ellipses The linear analysis for reinforced concrete and metallic shells, computed using the software SCAD gives the numerical and graphical results that are presented in the following tables. Table 1 The result of the analysis for reinforced concrete shell Concrete B30 Thickness (cm) Maximum displacement (mm) Stability factor Fixed support Hinge support Fixed support Hinge support 15 33.58 75.07 3.7422 1.091 20 17.36 33.6 7.9682 2.2011 25 10.37 20.38 12.6648 3.3531 30 6.55 13.01 19.2451 4.94 When using metal as a material, the results of the analysis gave large values for displacements, which indicates the efficiency of using concrete in this type of elements with a large span and in terms of economic feasibility also. Table 2 The result of the analysis for steel shell Steel qualitative Thickness (cm) Maximum displacement (mm) Stability factor Fixed support 20 50.7 20.96 30 20.6 46.98 Let us consider now a FE model of cylindroid Fraser as shown in (figure 10). The model is plotted in the software SCAD 11.5. Figure 10. FE model of cylindroid Fraser This shell is subject to the following loads: 90. self weight; 91. live loads (2 kN/m2); 92. dead loads (10 kN). The shell is investigated with a fixed support. The load combinations in the used software SCAD is: (1.2 ∙ self-weight + 1.3 ∙ live loads + 1.1 ∙ dead loads). The span is 25 m. The result of the analysis for the span of 25 m Steel qualitative Thickness (cm) Maximum displacement (cm) Stability factor Fixed support 20 25.91 4.75 30 4.84 39.15 The result of the analysis for the span of 25 m Conclusions Concrete B25 Thickness (cm) Maximum displacement (cm) Stability factor Fixed support 20 25.6 6.46 30 13.36 14.47 Table 3 Table 4 The investigations of the stress-strain state are done for shells with the shape of cylindroid with two directrices ellipses and cylindroid Frazer. 99. For the same thickness, loading and span, the reinforced concrete shells has minimum displacements. 100. For thickness 20 cm the steel shells have the same maximum displacements. For the thickness 30 cm the maximum displacement is more in steel shells. 101. It is more optimal to use reinforced concrete shells than the one in steel. 102. A large span (till 30 m) shells can be designed with reinforced concrete. Wang Z.Z., Jiang L.Y. (2011). Analysis of Cylindroid Shell Subject to Internal Linearly-Increased Pressure. Advanced Materials Research, 239-242, 2584-2589. Deng Hua Dong, Shilin Bao Hongze. (1998). Analysis method of pretensioned reticulated structures. Journal of Zhejiang University (Engineering Science), (5). Korotkiy V.A., Usmanova E.A., Khmarova L.I. (2016). Dynamic connection of second-order curves. 2nd International Conference on Industrial Engineering, Application and Manufacturing (ICIEAM) (pp. 1-4). IEEE Conference Publications. doi: 10.1109/ICIEAM.2016.7911687. Tocariu L. (2007). Stages in the study of cylindroid surfaces. Journal of Industrial Design and Engineering Graphics, (3), 37-40. Perez A., McCarthy J.M. (2002). Dimensional Synthesis of Bennett Linkages. ASME Journal of Mechanical Design, 37(11), 1245-1260. Krivoshapko S.N. (2017). 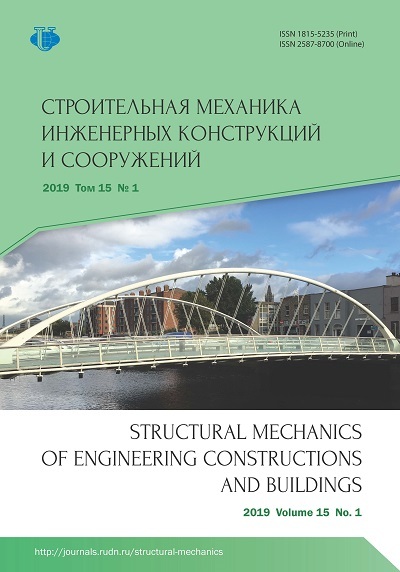 The application of conoid and cylindroid in forming of buildings and structures of shell type. Building and reconstruction, 5(73), 34-44. Copyright (c) 2018 Gil-oulbé M., Qbaily J.